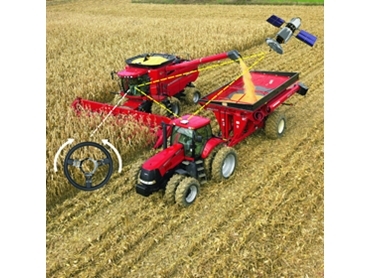 A Case IH invention has won a Gold medal in the SIMA Innovation Awards ahead of the Paris agricultural show's opening in February 2011. A new automatic vehicle-to-vehicle (V2V) synchronisation technology – not yet commercially available– was recognised for its innovation and potential to help farmers save time and money. V2V synchronisation technology will boost harvesting efficiency. By using a 'master and slave' approach, the combine becomes the central 'master' and takes control of the tractors/chaser bins. Central to the system is a wireless connection, which is used to manage data exchange between vehicles. The combine takes control and dictates forward speed, vehicle alignment and direction of travel to the tractor when it enters the 'active zone.' The driver of the combine is then able to monitor the unloading and status of the chaser bin. The main advantage of this system is consistent and repeatable unloading on-the-go during harvesting as the individual tractors/chaser bins arrive at the combine. Even with unskilled operators it is possible to perfectly fill trailers and avoid spilling the valuable crop over the edge of the chaser bin. The V2V synchronisation system’s precise vehicle alignment eliminates the risk of tractor and combine collisions and reduces operator stress and errors. "The V2V synchronisation system lets you synchronise unloading operations in real-time, increasing efficiency a stage further. And that is just the beginning of this very promising development," said Case IH’s Advanced Farming Systems Product Manager, Ross Johansson.